NutriBullet, Vitamix, and more: are blender nutrition claims true? A nation of time-starved consumers looking for a health edge has embraced the blades of a blender. Americans trying to cram more fruits and vegetables into their diet have gone on a smoothie and juicing binge. There's even a new product category, the "personal blender," which has seen a 17 percent growth in the past year alone. It has a smaller counter footprint than a traditional KitchenAid-style model and sports a smaller container, 3.5 oz or less container, that often doubles as a to-go cup. And why not? After you've blitzed your beets, clobbered your kale and rendered your peanuts to powder, a liquid meal can be convenient. Instead of cooking, cutting and chomping, just gulp and go. But some mixer makers also believe their products unlock nutrients that your body wouldn't be able to get to otherwise. One of them, the popular "NutriBullet," made by Capital Brands, says it turns ordinary foods into "Super Foods." By pulverizing ingredients "at a cellular level," the product claims it "releases vital nutrients that would have otherwise remained locked inside un-chewed bits of food." Recently, the company's Pro 900 model was rated a "safety hazard" by Consumer Reports after the device's blades cracked or broke on two units in their durability tests, raising the risk of accidental ingestion. A lawyer for Capital Brands company called the results "puzzling" and noted that the 900 series used the same blades as previous versions of the blender, which passed Consumer Reports durability tests for years. The spokesman said the company would be issuing a response to the report with the Consumer Product Safety Commission. Meanwhile, the NutriBullet manual says, "Even when we eat healthy foods, our digestive system does not break them down enough to release the full spectrum of vitamins, minerals, and phytonutrients they contain." They're not alone. 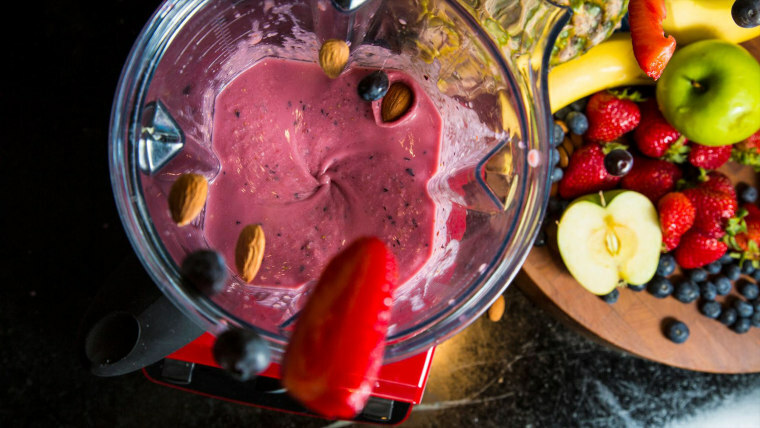 "Nuts, for example, pass right through the body," when eaten normally, said Jennifer McCabe, general counsel for Euro-Pro, makers of the NutriNinja line of blenders. An executive for Vitamix, whose blenders for the home can run up to $449, told Businessweek that his companies' blenders are "theoretically...healthier for you because it emulsifies plant matter more than your teeth can by chewing it." A theoretical possibility, yes, said Marion Nestle, a professor in the Department of Nutrition, Food Studies, and Public Health at New York University. But she said there wasn’t sufficient evidence to prove that food chopped up in a blender results in more nutrients being metabolized by the body then if it was served on a plate. "Oh please. That’s what teeth are for," said Nestle. Nutritionists grant that people who had suffered radiation to the throat, suffered from digestive conditions, or were otherwise unable to take solid foods might benefit from the convenience of a blender. However, in those cases a blender's main benefit is as a means for processing food, rather than transforming the foods themselves. It’s not as simple as breaking down the cell walls, said Stanford University nutritionist Jo Ann Hatter. What actually breaks the bonds between food molecules are the digestive enzymes in your stomach. "If we needed those kinds of blades we would have those in our digestive system," said Hattner. None of the companies provided original research upon request that showed their specific blenders offer health benefits over eating food with your teeth. But Colin Sapire, CEO of Capital Brands, makers of the NutriBullet, sent several related studies from his company's files. One of them, "Food Microstructure Affects the Bioavailability of Several Nutrients," (PDF) published in the peer-reviewed Journal of Food Science, surveyed the results of other studies. It found that disrupting the "food matrix" "may favor or hinder their nutritional response in vivo [in the body]." There's no "Neo," in the food matrix, but there are nutrients suspended in fibrous grid. It's what gives a carrot its shape and keeps it from being just an orange puddle. "For carrots, you get more beta-carotene if they are turned mechanically into juice than if you chew them," wrote study co-author José Aguilera, a professor specializing in food engineering at the Pontifical Catholic University of Chile in an email. "Most nutrients are inside cells that must be broken down for their release and our digestive system (mastication + digestion) is not fully efficient in doing this." NutriBullet's Sapire also cited an unpublished 2008 study at the University of Toronto, funded by Vitamix, that found their high-powered blender resulted in smaller particle size than a standard kitchen-top blender or chewing. "Cell walls are little capsules that make up plant material," said study author Cryil Kendall, a professor in the Department of Nutritional Sciences at the University of Toronto. "If you don't disrupt the cell walls, our enzymes can't break down the cell walls and the nutrients within those capsules are not accessible." "When you have more cell wall disruption, you should have more nutrients available," he said. So why don't we just eat all our meals from a tube? Other scientists caution that something will go missing from our diet. "The broad claim that breaking down structure in this way invariably makes the nutrition more available can't be assumed," said Bruce German, a food chemistry professor at the University of California at Davis. "The structure in [the blended mix] can make some nutrients more available, and some less available." "It has to be tested ingredient by ingredient," he added. And it's dependent on each individual, their diet, and activity levels. "A lot of the science that either substantiates or refutes this just hasn't been done," said German. Even if a particular study showed that an ingredient when blended results in a higher concentrations of its nutrients in the blood plasma, that's not enough, said NYU's Nestle. "This would not answer the question about whether slightly higher blood levels of a particular nutrient make any difference to people whose nutritional status is already pretty much adequate." The Vitamix study author concurs. "All my research shows is particle size," said Kendall. "If blending a fruit or vegetable allows you to enjoy it more, that's great. I don't know how much of a difference an increase in bioaccessibility means." Certainly a blender can win on expedience. And a tasty shake can be a great way to get more fruits and vegetables in your diet. However, for a healthy person, from a metabolic standpoint, "it's not any better than eating the food in original form," said TODAY's Diet and Nutrition Editor Madelyn Fernstrom. So feel free to pick up one of these blenders if they're easier to use. But don't be worried that the apple is just going to fall through your ribs if you eat it with your teeth. Contact Ben Popken ben.popken@nbcuni.com or @bpopken.